As we pointed out in a previous post, a very rich collection of essays in honor of Prof. Kurt Siehr on his 75th birthday has been recently published by Eleven International Publishing and Schulthess, under the editorship of Katharina Boele-Woelki, Talia Einhorn, Daniel Girsberger and Symeon Symeonides: Convergence and Divergence in Private International Law – Liber Amicorum Kurt Siehr. A previous Festschrift was dedicated to Prof. Siehr in 2000: “Private Law in the International Arena – From National Conflict Rules Towards Harmonization and Unification: Liber amicorum Kurt Siehr” (see Google Books). Part I: General Aspects of PIL Law-Making. Jun Yokoyama, Renvoi in Japanese Private International Law. Part II: Family Relations and Succession. Teun Struycken, The Netherlands Surrogacy, a New Way to Become a Mother? A New PIL Issue. Part III: Contractual and Non-Contractual Obligations. Lajos Vekas, Hungary Questions of Contract Law in the New Hungarian Civil Code. Part IV: International Litigation and Arbitration. Spyridon Vrellis, The Validity of a Choice of Court Agreement Under the Hague Convention of 2005. Marc-André Renold, The International Scope of Application of the Swiss Rules on the Due Diligence of Dealers in Cultural Property. 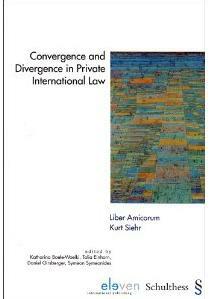 Title: Convergence and Divergence in Private International Law – Liber Amicorum Kurt Siehr, edited by Katharina Boele-Woelki, Talia Einhorn, Daniel Girsberger, Symeon Symeonides; Eleven International Publishing – Schulthess, The Hague – Zürich, 2010, 918 pages. ISBN : 978-90-77596-93-7 (Eleven); 978-3-7255-6165-0 (Schulthess).